Joseph Hall invented Perl Graphical Structures, which he used in Effective Perl Programming and we used in Intermediate Perl. To make the images for the first and second editions, I wrote PeGS::PDF (on Github). I used this to create all of the PeGS structures in the book. Here are a couple of examples, which you can also find in the distribution. 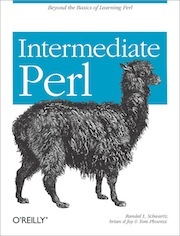 I can make the basic structures from Learning Perl as well as the references and structures from this book. I can’t make arbitrarily deep structures because I didn’t do the work to recursively place everything in non-overlapping spaces. I can also make a hash.